I won't deny it: it's been a heavy couple of weeks at High In The Sky. But several rounds of antibiotics, steroids, X rays, trips to the GP, and I'm finally starting to get back on my feet. So I'm determined to look on the bright side! For ages now I've been enjoying posts by my blogging friend Carmen. On Fridays she likes to join in with one of the best tonics I've found anywhere: Rocking My World Friday. Now, this clever idea was, I think, dreamed up by Virginia of Celtic House Reading one of these let's-look-for-the-nice-stuff-that's-happening posts has cheered me many times in the past. Thanks Carmen! I'm finally going to take your advice and write one myself. Although I wasn't able to meet up with Mel from I Speak Melsh as we had planned, I'm still chuffed that she emailed to let me know she'd be in town and see if we could organise a get together. And when I had to call it off, she still made time to drop round a gift and a card, which I love. Thanks, Mel! maybe next time. No, what am I saying?! Definitely next time. Cards from two Ruths. Both very cheering, both much appreciated and now firmly pinned to my noticeboard. A husband who, without my knowing, went and bought me a magazine and secretly left it on the driver's seat of my car, so that when I went to a doctor's appointment on Tuesday morning, I found it and had something to read in the waiting room. Enough interests and things I like to do. I have only turned the laptop on to answer a few emails and meet some deadlines; but I have been reading and trying some rows of crochet. I'm very grateful for good books and liking to make stuff and how easy it is, these days, to order things by post. On the subject of crochet: I've mastered what in the UK we call double stitch and treble stitch. Now I'd like to make a blanket - any experts out there? (I know there are!) Do you think I'm brave enough to start a ripple blanket? I have some lovely soft colours in mind. A late Christmas present. Posted before Christmas, it arrived here as a nice surprise just before I got sick. As I didn't know I was getting it, I didn't know to be disappointed that it hadn't arrived - so it's all good. An email from Mitra to let me know that the stories her dad had been posting for Storytelling Sunday have been spotted by someone publishing stories about Iran and the Peace Corps. Exciting times! The return of the Great British Sewing Bee. Tuesday night TV just got a whole lot better. last time round, I had a favourite from the beginning. This time I'm not so sure. Retro re-runs: just the thing when I don't feel like doing anything else. That's lots of games of Tetris whilst keeping an eye on Cagney and Lacey on daytime TV. Love the colours, the cars, the dirndl skirts, the beanie hats..
and that's what has been Rocking My World, keeping me cheerful, right now. It's going to be a while before I'm all caught up, and I'm going to take it slowly. But it's so good to be back. good to hear you are on the mend. I think a ripple blanket would be a good project - plenty of rows with no shaping and each row is the same stitch repeated. Are you thinking of the one from attic24? So good to hear from you Sian. The one good thing about being sick that I try to remember in the midst of it, is that first day when you feel completely well. That is something that can rock your world. If it hasn't happened already, I'm praying it is coming soon for you. Bless you and do take care to try not to overdo it as you recoup. So glad you are feeling better! The cheery yarn photo is enough to do it!! Can;t wait to see what you do with it. Take the "catching up" slow---no relapses allowed! PS Have you seen "arm knitting?" That's the surprise project for my pajama party. I need to make one first to be sure it's easy enough for all the non crafters in my bunch! Glad you are getting better! Seems a lot of us have been out of commission for bits of this Winter. Glad you are enjoying the crocheting. I haven't done it since I was a kid! What lovely colour yarns! They certainly do cheer me up. Glad you are mastering the crochet stitches, I have struggled in the past and wouldn't say I am good but practice makes perfect. A blanket is a good project because you can practice your stitches while making something useful. So glad to hear that you are on the mend and that there have been surprises and nice things happening to help you through. Good to see you back blogging. I shall look forward to seeing what the wool turns out to be. So glad you're feeling a bit better. The wool looks lovely....I am quite envious that you're managing to crochet....it is something I've never been able to master. Welcome back! This is such a wonderful post and has brightened my Friday morning as I look forward to the weekend. My favorite of these is picturing that magazine your sweet hubby left for you to find in the car - such a loving thing for him to do! Hope you continue to feel better & get your strength back! Glad to see you too :). Oh, Cagney and Lacey! I had no idea they were still on TV ... And a ripple blanket sounds very pretty. Especially with that gorgeous colour combination from your photo. Hooray, it made me smile to see you back blogging and to see those fabulously bright yarns. Your positive attitude has put a smile on my face today Sian. So glad to see you pop up in my reader this morning! I'm sorry you've been so sick, but very glad to hear you're recovering! Those bright colors certainly cheered me up! Pleased to hear that you've turned the corner - and after all those tests and medicines it's about time too! As for your crochet, you need to contact my friend Denise over at Den's Crafty Diary who is the grand master of ripple blankets and all things crochet. The Sewing Bee does make me smile, why do people who have never put a pleat in a skirt or handstitched a waistband go on a programme for the best needleworker in the UK? Love it! Just your sunny photo cheered me up :) I am glad to read that you are on the mend and I hope you get back on your feet and feel 100% very soon! I am off to check the links you left us. Oh I can't tell you how fabulous it has been to come home and find a new Rockette, counting your blessings. Thank you so much for joining in, I'm so sorry that you've been unwell but glad that you can see the little positives that occur that brighten every day. I love love love what hubby did in leaving a mag in the car, how thoughtful and how good to have something to read whilst you are waiting. I'm envious that you are mastering crochet, it's something I've never got to grips with! Belated unknown about Christmas presents - that's fabulous too. I hope your weekend is full of positive rocking moments and that you start to make improvements. So happy to hear you are feeling well again. Sounds like it was a bad one. Everyone in my neck of the woods has been sick multiple times this season. It just seems to be a bad year for it. Well, spring is around the corner and I love how you always look on the bright side. A fun post to read and that is very exciting about you starting a crochet blanket... go for it! 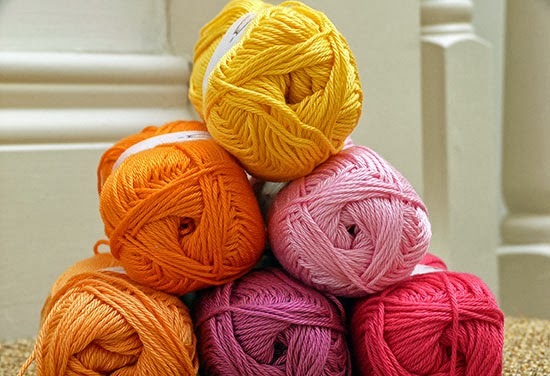 :) Love that photo of the beautiful yarn! Sending healing thoughts your way. Having a week off is cheering me these days. Sian! I didn't realise you'd been so crook ... that is terrible! I've been away from the computer so much more than usual and I missed seeing you but assumed you were busy ... well, you were busy, just not in a good way I suppose! Take care and I hope you continue to make a good improvement. Oh what a sweetie you married! Glad you're feeling better. Glad you are on the mend, you and Becky had some long lasting stuff! LOVE how considerate the sweet hubby was with the magazine. I have so many friends who say "oh, I'd be bored to death if I stayed home" or "I can't retire, I wouldn't have anything to do" Like you I appreciate that I have plenty of interest, projects and volunteerism to keep me busy and happy. Glad you are back, take it slow and eays! glad you are getting better and managing to look on the bright side! I had to google dirndl skirt! Glad to hear you are recovered, those yarns do look lovely. Hope the recovery continues - love the idea of the magazine on the car seat. It is lovely to see a new name on the Celtic House list. It sounds as though you have been through a tough time, so I am glad you feel well enough now to join in, and you certainly found lots to be grateful for. I love the pile of bright yarns. I'd say Go for the crocheted blanket. I feel that all crochet is just slight variations on one stitch, so once you have mastered that, the rest just happens! Just be careful if you find a pattern on-line. Most of them seem to be American and they use sc (single crochet) for what we call dc, and dc for what we call treble. I have crocheted lots of blankets, and find them quicker to make than knitted ones. Also they keep you lovely and warm while you are making them! You have a very thoughtful husband to buy the magazine. Well done to him. Glad you are feeling better! I like ripple blankets and catherine's wheel ones as well. If you can do those two basic stitches (single and double to me) you can do a ripple blanket. Look up Catherine's wheel as well. Its the same basic double stitch (treble for you) just in clumps. Make for a really nice look in mulicolored blankets. Reading from the front! Glad you're back. Glad you are feeling better and sorry you couldn't meet up with Mel. Good luck with the blanket! Great to see you back Sian. Which is what I thought when I read it on Friday and was too distracted to comment! That wool is beautiful and I look forward to seeing your ripple if you take the plunge. I seem to remember my friend saying that the first chain has to be a multiple of something and once you have that right it's plain sailing. I think her pattern was from Lucy's Attic 24 blog. So happy to read this Sian - yay! Here's to many more RYWF's :) It really makes a difference with MY mindset for sure! She says. Late again! Glad you're feeling better - I type this with snotty tissues by my side! Glad you're feeling better despite all the tablets. I love happy mail especially when I'm feeling down, glad the two Ruths cheered you up. Go for it with the crochet, it's all a learning curve! Wow, that was a late (or very early) Christmas present! Sorry I didn't stop by last week, it's ahreat way to count your blessings isn't it. I love the photo that heads this post and very much enjoyed reading what brightens your days. I'm also glad to know that you are on the mend--the blogging world isn't quite right when you aren't in it. Happy to hear you are feeling better Sian. The yarn sure is colourful and makes me want to pick up some needle or hooking skills!